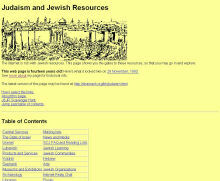 The Pioneers: very early (and still online) websites presenting Jewish content. The Treasures: websites so exceptional they deserve special attention, including a few with unusual and hard to find content. 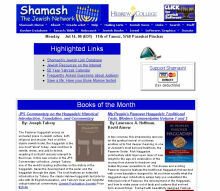 Shamash (Hebrew for "servant") was "the" Jewish site from 1992-1998 and home to many email lists. In those ancient days of the internet website hosting was hard to find and expensive. Shamash, itself hosted on the main frame (what's that?) 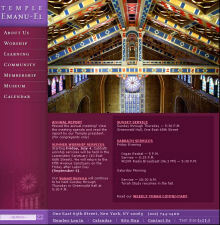 of a New York State research consortium, made space available on a cost-sharing basis to many Jewish organizations. The page was designed in a time when connections were dial-up and modems so slow that images were rarely used and, if shown, were often postage stamp size. In the days before search engines, such link lists were important ways to find websites. This list is still on Shamash (see above). Like their magnificent structure on Fifth Avenue and East 65th Street in New York, their website is deep and beautiful throughout. The virtual tour of the building is impressive. But to us the most remarkable aspect of the site is its attention to history, with a well illustrated timeline. While only highlights of their Museum of Judaica are shown, each image has an extensive explanation. Last, while most websites are created by many professionals, staff and volunteers, too often the only credit shown is the web developer. This site's Acknowledgements page does it right. 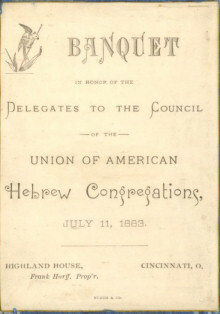 We show you the four pages of this menu of a dinner that helped to establish the Conservative stream in American Judaism as many more traditional Jewish congregations now felt that there was no place for them in the Union of American Hebrew Congregations. Beautiful virtual exhibits of some of the world's oldest Jewish books, from the greatest Jewish library in the Western Hemisphere. Thanks to the Gutenberg Project, treasures like the Menorah Journal can be read or downloaded free. 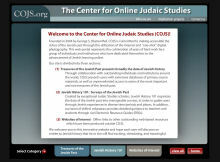 COJS aims to make accessible the riches of the Jewish past through the utilization of the internet. It is a leader in the digitization of Jewish history. Their website is dazzling. Worth a visit to see websites on the Jewish past, each one created with good graphics and solid scholarship. You may ask (as we do) why text is often in text-only pages, separate from images and separate from videos.